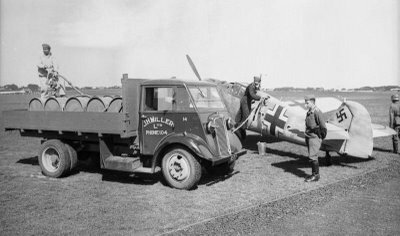 Obviously the aircraft shown on this picture is not a Spitfire… what makes this photo interesting is that it shows the German Luftwaffe operating from British soil. The island of Jersey, together with other Channel Islands was captured by the Germans following the fall of France in 1940 – the islands were the only part of the British Commonwealth occupied by Germany. The Jersey Aerodrome was subsequently used during the Battle of Britain as a forward base for rather short-ranged Messerschmitt Bf 109 fighters. Performing the role of an improvised fuel bowser is a lorry from local entrepreneur J H Miller. The unique rank markings displayed by this aircraft identify it as the Messerschmitt Bf 109E-4 of Hauptmann Wilhelm Meyerweissflog, the Second-in-Command of Jagdgeschwader 53, a unit that operated from La Villiaze, Guernsey during July 1940. This aircraft made a forced landing at Monkton Farm, near Manston, on the 5th September of that year and Meyerweissflog was taken prisoner.